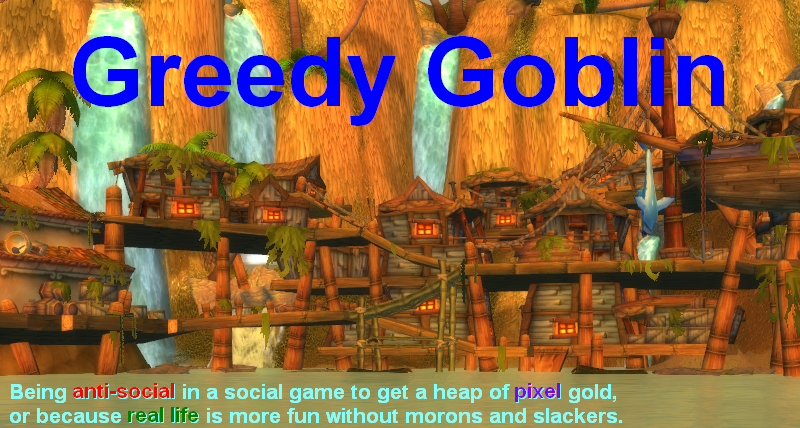 Greedy goblin: Let's increase the pie! Competitive goals are necessarily zero sum. By climbing up the ladder, you push others down. You can't blog "this is how you climb", since the readers compete for the same spots. Also, the way to climb is usually already covered by those who are high: world top guilds gladly share their boss strategies after they killed it. Needless to say, those who actually reached something are more likely give good advices than those who throw around theories with no personal accomplisment. In the real world, we try to "increase the pie": making goals reachable to people who couldn't reach it before. Today a poor person on medicare gets better health care than a king got 200 years ago. Theoretically, we can do this in games. For example my PuG [pick up group] to Ahead of the Curve idea shows all good players how to do Heroic (and likely Mythic) raids in time by abandoning scrub "friends" and playing with randomly picked similar good players. Such ideas are always unorthodox. "PuG" was a swear word in WoW and the idea that PuGs can reach higher than established guilds was nonsense. Yet I got the "ahead of the curve" before 85% of the raiding guilds (who killed bosses eventually). Same for the "money is power" and "stats over PR" project in EVE that shown the way to everyone to affect the game World, while previously it was believed that "making friends" and "metagaming" are needed to do that. This way much more people can be more than disgruntled highsec nobody or simple line member. Is it an "everyone is happy" result? Let's see what really happens if more good players raid in PuGs! Previously there were many "casual raiding" guilds, full of "casual raiders", with PuGs they split into a few "raiders" and lots of "non-raiding scrubs". While the pie was increased (more heroic and mythic bosses killed), the difference between the goods and bads also increased. It seems every good idea cuts into the middle class, grab a few people and pull them up, while the rest sink. I doubt if we can help that. Anyway, the next project must have a very specific goal (regardless what game it will take place): to increase the "GDP" (bosskill count, PvP damage count, whatever) by mobilizing skilled players who are not yet mobilized, but sit in the swamp of M&S. It won't be easy, especially that most of my recent experience is from a game I cannot play anymore. It's possible that I simply have to play a game for a few months before my brain adjust and can recognize interesting niches instead of figuring out an EVE project and trying to apply it to another game. Do something that impacts real life! Even if its over the internet. Maybe how good people can use the real stock market, or an unexploited business opportunity. I would imagine you have a readership and following of people that if you named a game, you could assuredly get 10-50 like minded people to join with you. If Gevlon does go with people selected from his readers, it will be extremely similar to just trying to create a competitive guild. The only difference would be having a very small pool to pull candidates out of, instead of the whole game. What he wants is to change the way random people think, in a way to improve them and, eventually, the game. We, the readers, are still a random bunch of people. And going into a new project with a core of people who believe in meritocracy and prove the efficiency of such a group could be a part of a decent project. Also, pulling resources from the reader pool does not mean that any other pools are closed for recruitment of other randoms. In the end, any person in a group involved in this kind of project would only be able to stick around on merit, that is the point. A lot of people who reads this blog would be willing to put in effort, because they believe in the general concept of meritocracy. Having such a group enter a new game, explore, adapt, learn and then conquer it in less time than any established guilds (or whatever), does speak to the merit of prioritizing merit over friendship. My objection is simply that since most of the readers are already interested in meritocracy and want to be efficient and successful, they already do what Gevlon is trying to achieve. It is my understanding that he wants to affect the masses and change the average player's playstyle from "Fun / Friendship" to meritocracy. Failing that, he wants the players that fail to adapt to quit the competitive game. b) an already competitive (or trying to be) guild that is obviously based on meritocracy. The only way to change people is to take their hand and show them how it is done. To take an EVE example, this fundamental is also the idea behind his "I gank because I care" initiative. If he instead had a group for people who knew how to mine or transport goods securely, and only people who were interested in safe mining / hauling wanted to join him, he would achieve nothing. Said individuals had already shown the initiative required to change. Yes, they might need to read on it / ask questions, but they already have the required state of mind. Gevlon's heritage is for this readers to go and do projects of their own that promote meritocracy, not simply follow him around, supporting him if needed. I would like to see a mobile/cellular game get the Gevlon treatment. The pay to win crowd vs the free to play. Game of war would have been perfect for you 2 years ago. When the f2p could game the system. Now it's jumped the shark and only whales are left. Would increasing the pie include adding a new game for players to play. A game that rewarded the player atributes you strive to reward and punish the attributes you mock? perhaps its time for you to get into game development.